Summer and swimming pools are synonyms, or they should be! A unique summer experience should include discovering one or more of the most unique swimming pools in the world. But which one of those is the most unique swimming pool? The largest pool in the world, the infinity pool that juts out into the sea, or the one carved in a cave? Many resorts and hotels around the world have unique swimming pools that serve as main attractions to the hotel, and sometimes even to the whole city. Check out this list of the most unique swimming pools around the world. You can access this infinity seawater pool right from your porch in this luxurious hotel, and it takes you right into the sea. Alongside the Olympic-sized pool, there is also a children’s pool and an indoor pool. 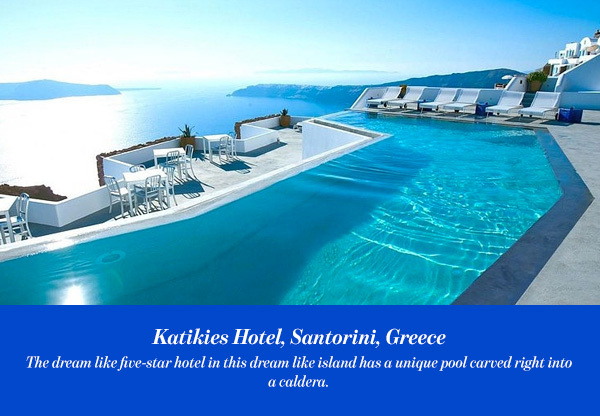 The design of this hotel and resort was inspired by the Minoan palaces, and you will definitely feel like royalty if you happen to view such a pool from your room. This exclusive resort boasts one of the most tranquil and unique swimming pools imaginable. The spectacular infinity pool with bubble generated seats, is situated among endless rolling sand dunes and a natural desert landscape. The dream like five-star hotel in this dream like island has a unique pool carved right into a caldera. The cave pool provides a shadow and a refreshing swim with a marvelous view. 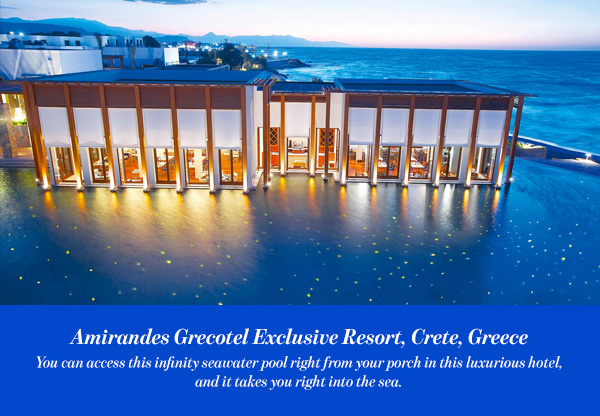 The hotel also offers another unique experience with an infinity pool, situated 90 meters above the Aegean Sea. The hotel lies in one of the most magnificent natural settings in the world, and provides a splendid environment affording every luxury. Enjoying the summer there is definitely a once in a lifetime experience. 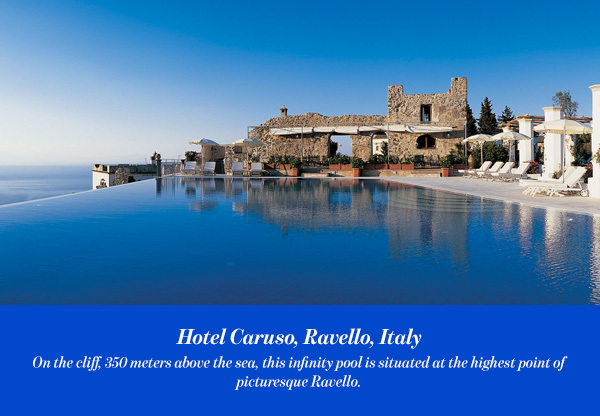 On the cliff, 350 meters above the sea, this infinity pool is situated at the highest point of picturesque Ravello. You can just relax in the pool and enjoy the gorgeous views of the coastline. The beautiful unique hotel is established in a renovated 11th-century building, certainly a marvelous experience all around. 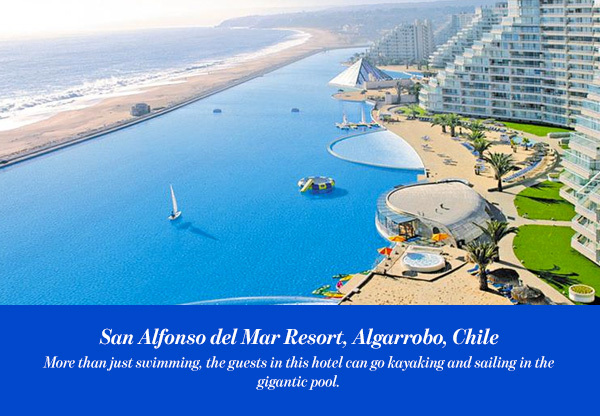 More than just swimming, the guests in this hotel can go kayaking and sailing in the gigantic pool. 1 kilometer long and 35 meters deep, this swimming pool is the largest and the deepest pool in the world. The huge pool contains around 250 million liters of seawater, The water is pumped from the Pacific ocean, filtered, and treated. The ultimate natural experience. 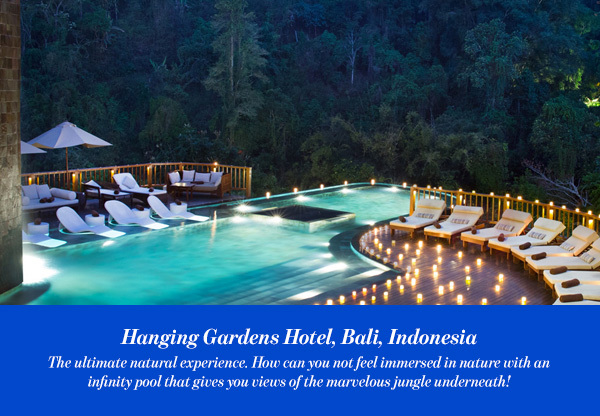 How can you not feel immersed in nature with an infinity pool that gives you views of the marvelous jungle underneath! Moreover, imagine a villa with a private infinity pool! Overlooking the jungle! This should be a must have swimming experience on everyone’s bucket list. 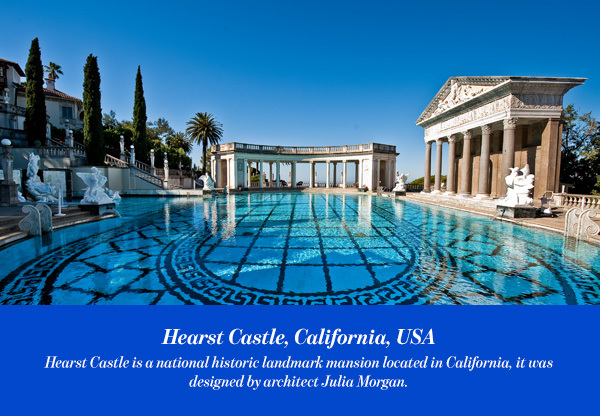 Hearst Castle is a national historic landmark mansion located in California, it was designed by architect Julia Morgan. The site was opened to visitors in 1958, the site attracts millions of travelers each year. The Neptune pool is the name of the outdoor swimming pool in the castle, alongside its indoor partner the Roman Pool, it is a testament to opulence and classical architecture. 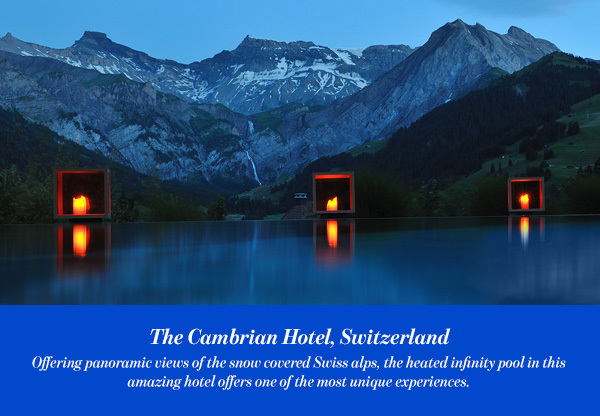 Offering panoramic views of the snow covered Swiss alps, the heated infinity pool in this amazing hotel offers one of the most unique experiences. The hotel offers indoor pools as well, but if you go there you must try swimming in a heated pool among the snowy mountains at least once. A swimming experience wrapped in a safari experience for the ultimate vacation. 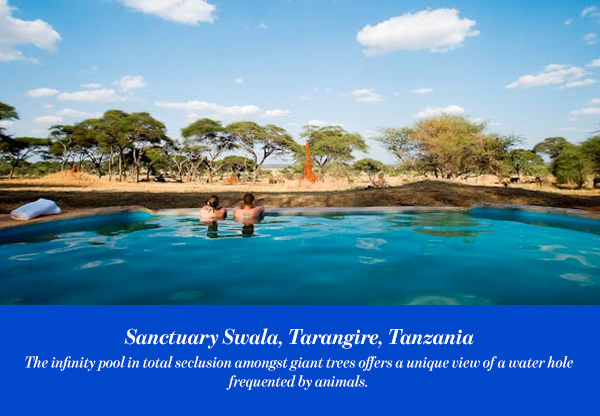 Sanctuary Swala is located in a secluded area of Tarangire national park, one of the most exciting parks in the country. The infinity pool in total seclusion amongst giant trees offers a unique view of a water hole frequented by animals. This geothermal hot spot located in Grindavík, Iceland is one of the most famous pools in the entire world. The amazing extensive spa is built around the hot spot, which makes it one of the best spas in the world. Make sure to visit the man made waterfall, although on busy days you may have to wait a little while to enjoy its refreshing power. 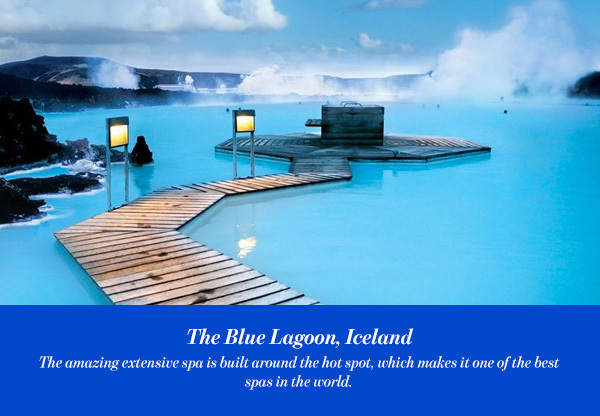 Today, Blue Lagoon is recognized as one of the wonders of the world for its beauty and health benefits.